Ecumenical Patriarch Bartholomew I of Constantinople during his meeting with Russian Orthodox Church (Moscow Patriarchate) head Krill informed the latter about the decision to grant the Ukrainian Orthodox Church (UOC) autocephaly, the head of the information department of the UOC (Kyiv Patriarchate) Archbishop Yevstratiy (Zorya) has said. "Later, after the ROC delegation departed, Metropolitan Emmanuel, who was a representative of the [Ecumenical] Patriarch at the holiday in Kyiv in July [at the 1030th anniversary of the baptism of Kyivan Rus] addressed journalists with short statement, the essence of which was in the phrase, "We INFORMED" the patriarch [Kirill of Moscow] of the decision to overcome the division in Ukraine and the granting of autocephaly, which is BEING IMPLEMENTED," Archbishop Yevstratiy said on his Facebook page on Friday afternoon. Yevstratiy said an official communiqué is expected to be issued later. "Therefore, the statement may not be literal," he said. 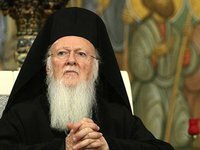 After some time, he also cited a number of quotes from the news of the Greek-language edition of the Orthodoxia.info ezine, which supports the position of the Ecumenical Patriarch. One passage he translated as "The die (dice) is thrown! Ukraine receives autocephaly." "'The Ecumenical Patriarch informed the Russian Patriarch that the decision to proclaim autocephaly for the Ukrainian church had been taken...' 'The Ecumenical Patriarch explained to the Russian delegation that the decision had been made and that relevant processes were already underway,'" Yevstratiy said, quoting the news source. He also cited Metropolitan Emmanuel's response to the question asked by Orthodoxia.info about statements by Russian representatives granting autocephaly would split the church. "Nobody wants to create another schism, but they want unity in the Church," the Metropolitan replied, adding, "The Ecumenical Patriarchate does not threaten anyone and does cannot be threatened." As reported, on April 17, 2018, Ukrainian President Petro Poroshenko announced his intention to appeal to the Archbishop of Constantinople, Ecumenical Patriarch Bartholomew, to issue a Tomos granting Ukraine's Orthodox Church autocephaly. He then called on the Verkhovna Rada, Ukraine's parliament, to support his initiative. On April 19, members of parliament supported the president's appeal to the Ecumenical Patriarch to provide the Tomos on autocephaly. The Holy Synod of the Ecumenical Patriarchate in Constantinople accepted the appeal of Ukraine's president and initiated the procedure necessary to grant autocephaly to Ukraine's Orthodox Church. In early August, Yevstratiy said a general meeting of the episcopate of the Ecumenical Patriarchate would be held at the start of September. He said then there were grounds to assume that the "Ukrainian question" would be discussed.